Jupiter's distinctive Great Red Spot is a storm twice the size of Earth that has blown for at least 150 years. Scientists are trying to recreate its colors in a lab to learn more about the planet's atmosphere. NASA scientists are trying to find what makes Jupiter's Great Red Spot red — by whipping it up in the lab. Despite more than 150 years of study, the Great Red Spot on Jupiter remains a mystery. The mammoth storm, twice as wide as Earth, swirls across the face of the largest planet in the solar system with winds peaking at about 400 miles (644 kilometers) per hour. Yet what could be causing the storm remains unknown. Observing Jupiter's atmosphere to determine the source of the storm's red color is a challenge. The planet's cloud layer make clear observations of the lower atmosphere difficult, and only slightly more is known about its upper atmosphere. Studies predict that Jupiter's upper atmosphere is composed of clouds of ammonia, ammonium hydrosulfide and water, which scientists suspect could be a source for the Spot. But scientists don't know if those chemical components, which make up only a small part of the atmosphere, could mix together to form the colors that make the storm so distinctive, much less how they might combine. "We're talking about something that only makes up a really tiny portion of the atmosphere," planetary atmosphere expert Amy Simon, also of Goddard, said in a statement. "That's what makes it so hard to figure out exactly what makes the colors that we see." Ammonium hydrosulfide is unstable when subjected to Earth's atmospheric conditions, so Loeffler heats up hydrogen sulfide and ammonia to create his own. Charged particles then assault the concoction, much as cosmic rays blast Jupiter's clouds. The researchers have identified the products of irradiating the colorless mixture, and their challenge now is to see if any of them have the precise reddish shade of Jupiter's storm. "That's the problem," Simon said. "Is it turning the right color red?" While ammonium sulfide could be a cause, the coloring could also come from multiple factors in Jupiter's atmosphere interacting. The massive storm has been studied for more than 150 years. 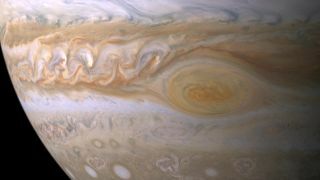 Possibly much more: While astronomers from the 1600s identified a similar feature on Jupiter, it is uncertain if it is the same Great Red Spot. Either way, the squall has endured far longer than any storm on Earth. Unlike Earth, Jupiter is a gas giant, with a liquid ocean of hydrogen around its core and an atmosphere dominated by hydrogen and helium. No solid ground exists for the storm to blow itself out over, allowing the Great Red Spot to last for more than a century. Studying the long-lasting storm can help scientists better understand the weather system on Earth, Simon said. After all, the weather on both planets function under the same laws of physics. She also said that studying Jupiter can improve understanding of planets outside of the solar system. "If you just look at reflected light from an extrasolar planet, you're not going to be able to tell what it's made of," Simon said. "Looking at as many possible different cases in our solar system could enable us to then apply that knowledge to extrasolar planets."